Make sure your work area is well ventilated if you are using a strong chrome polish or rust remover. Check the label for safety warnings. Select nontoxic and biodegradable products whenever possible to reduce inhalation or skin contact risks. Clear your work area and put down newspaper to catch spills and rusty liquid. If you need to take rust off your steel wheels, turning your bike upside down or placing it in a stand helps you access the rusty parts. Remove or adjust any parts of your bike that are in the way of cleaning or that could be harmed by cleaning. 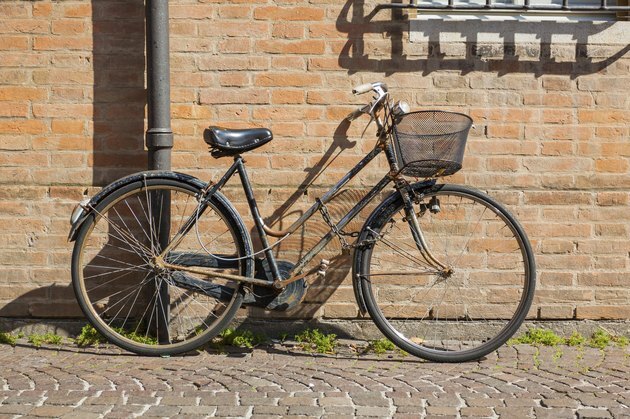 If your frame is rusty, removing brake and shifter cables, the chain or the wheels helps you clean efficiently and protects moving parts from polish or rust removers. If cleaning the outside of your wheels, keep the tires properly inflated to prevent water leaking into the rims and causing interior rusting. Spray or coat the rusted area with a rust remover. Let the remover sit for at least five minutes. Use the rough side of a sponge to scrub off the rust. If this does not remove the rust easily, use a wire brush or steel wool. Scrub gently at first to ensure you are not scratching the steel. Spray water or additional rust remover on a rag and use it to wipe the rust away. Repeat steps one through three until the rust is gone. Apply a light oil to cleaned moving or internal parts to prevent rust and scratching. Apply chrome polish, a light oil, rust remover or water to the chrome-plated area. Scrub the part with a crumpled ball of aluminum foil for about a minute. Use a wire brush or steel wool for severe rust, but be careful not to scratch the metal. Use a rag to wipe away loose rust. Repeat steps one through three if necessary to remove the rust. Apply additional polish to the chrome and buff with another clean rag.